Giveaway contest begins on November 3, 2014 at 8:00 am EST and ends on November 17, 2014 at 8:00 am EST. 1. Have a US residential address. 2. Be 18 years of age or older. 3. Not be employed by Atlanco®. 4. Choose from the available product sizes given. Winner will be announced on the morning of November 17, 2014. 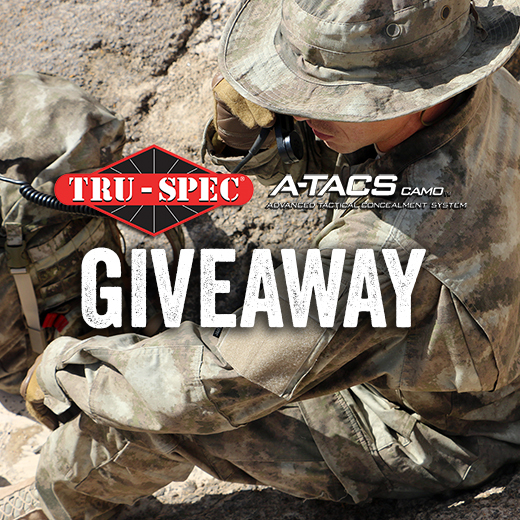 Winner may choose a TRU-SPEC® Tactical Response Uniform® Pant, 1/4 Zip Combat Shirt and Contractor Cap in either the new A-TACS AU Camo or A-TACS FG Camo pattern. By submitting, participants will be entered in future TRU-SPEC® promotions via our mailing newsletter. This entry was posted in Contest and tagged A-TACs, TRU-SPEC, uniform. Bookmark the permalink. ← When it all hits the fan, what will you be wearing?